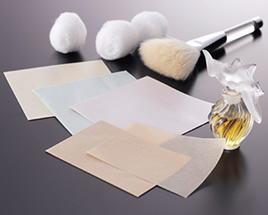 Oil blotting paper is Japanese traditional paper that women use to remove extra oil from their faces. Before they apply cosmetics on their faces, they use the paper because it helps them to apply cosmetics very comfortably. This paper is getting popular not only among women but also among men. There are variety of oil blotting papers with colors, aromas, and designs. We will develop the products for your request. Please contact us from the "Questions and Requests" form.